"Yo, ho, ho and a bottle of rum! Grab the booty, maties - in yonder chests! We'll count the doubloons after we set sail!" 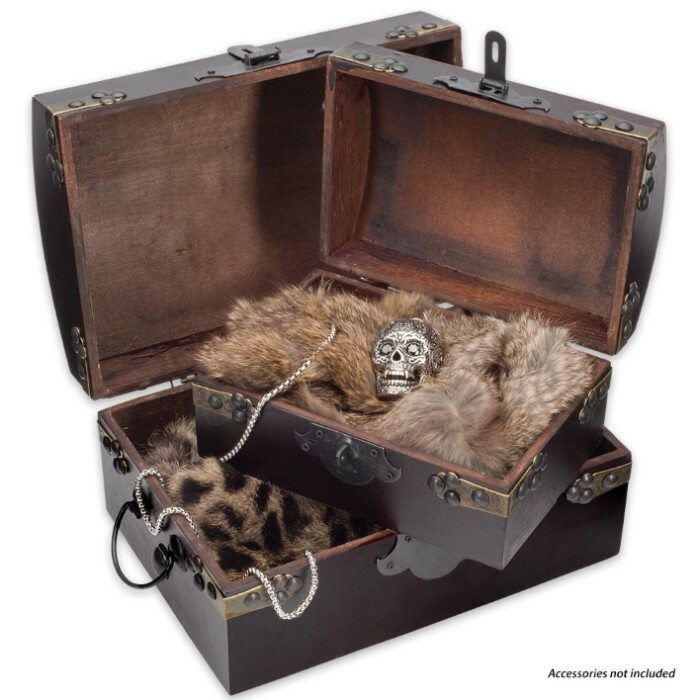 We can’t give you the exotic, adventurous life of a pirate on the high seas, but with these cool Pirate Treasure Chests, it's not so hard to imagine. Each wooden trunk is loaded with swashbuckling style and rustic accents, like antique brass-colored metal strapping, working latch and hinges, and other gracefully aged hardware. 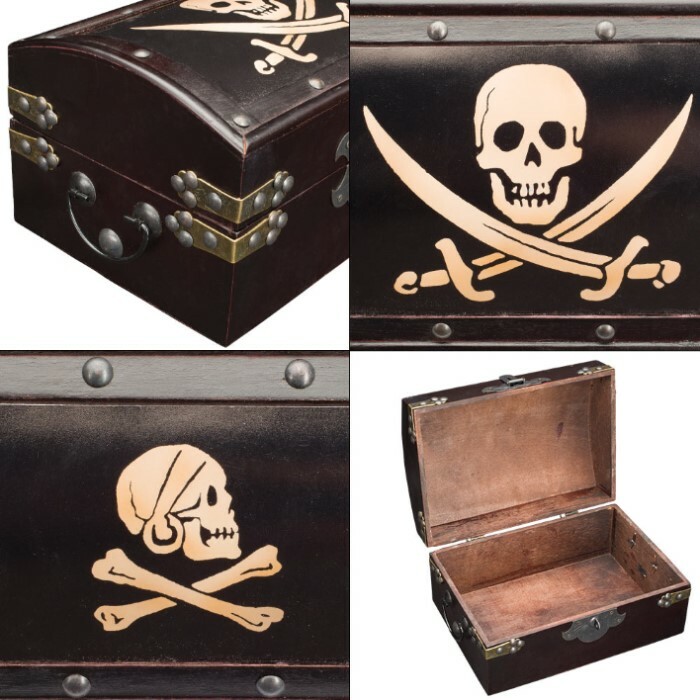 Iconic pirate head silhouettes are painted on the bowed lids of both chests - one in side profile, the other staring straight ahead. 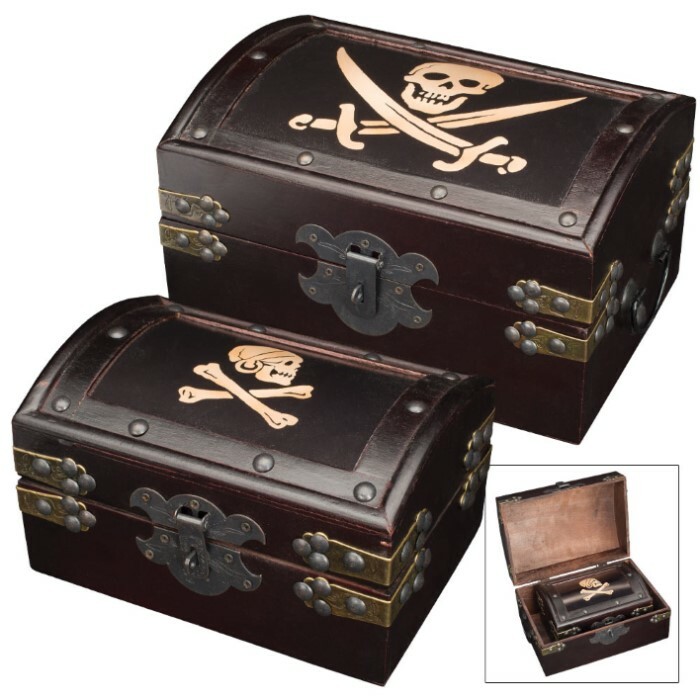 But don't let all the buccaneer imagery fool you - these stylish chests are ideal for holding way more than purloined baubles, stolen treasure or other ill-gotten pirate goods. At 9 1/2" wide x 6 1/2" deep x 5" high, the larger chest is perfect for keeping toiletries and personal items elegantly hidden in your bathroom; housing measuring cups, spices or other kitchen essentials on a counter or table; keeping your remote, TV guide and a bag of snacks always on hand and never wedged between couch cushions; and practically anything else, anywhere else! The 7" wide x 4 7/8" deep x 3 1/2" high chest is equally useful - perfect for smaller items like jewelry, pens and pencils, sewing kits, coin and stamp collections and much, much more. Regardless of what you decide to do with them, these eye-catching Pirate Treasure Chests will embolden and dress up any space and are sure to draw attention and praise. They also make fun, memorable gifts and are even great as props for cosplay or theater.